The narrator of Dror Burstein’s Netanya – a narrator we are lead to believe is Burstein himself – spends a night lying on a bench along the side of Smuts Boulevard in the town of Netanya, Israel, and as he stares up into the night sky he tries to grasp the vastness of the universe and the full extent of time from the Big Bang until the day when the universe might come to an end. As his mind shuttles between the cosmic and the minute, the faraway and the local, the distant past and the current moment, he realizes “how flimsy our existence is, how many conditions must exist and must continue to exist over the course of millions of years so that a single flower or a single pencil or a single book might exist.” Interwoven into the narrator’s contemplation of the universe is the story of three generations of his Jewish family, starting with his grandfather, who emigrated from Poland to Israel in the 1930s. If this all sounds very Zen-like, it is. Burstein’s book is infused with the writing of the Vietnamese monk and Zen master Thích Nhất Hạnh, who teaches that beginnings and endings are illusory. “The book you are reading now,” Burstein writes, “was begun by the clerk who recorded my grandfather’s data onto that immigration form” which permitted his grandfather to leave Poland in the 1930s and emigrate to Israel. At its best, Burstein’s prose succeeds in reinjecting a sense of awe and wonder back into our view of the universe and the odd miracle that is life, and partway through the book I began to have really high hopes that Netanya would achieve its ambitions. But by the end, it felt as if Burstein had tried a bit too hard or had repeated the same formula a few too many times to keep the sense of wonder afloat. Nevertheless, I look forward to reading more by Dror Burstein. Netanya includes seven photographs – an old family portrait, some documents, and some snapshots. 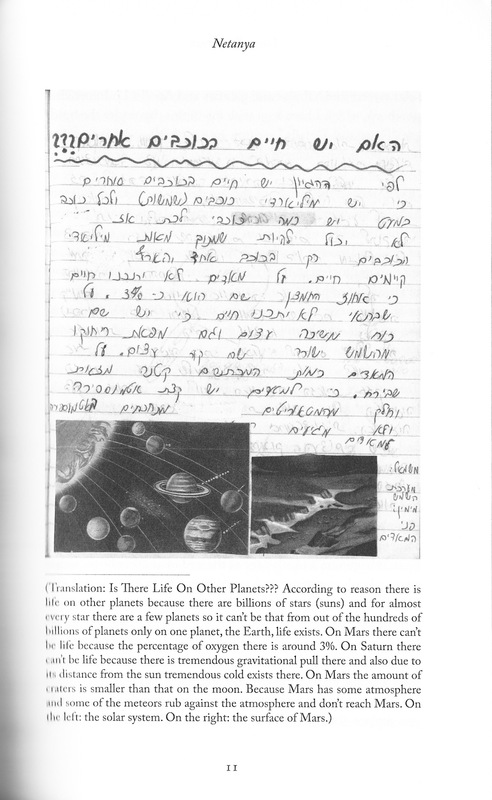 My favorite image reproduces a page from the narrator’s old student astronomy notebook. “You write a few lines at the age of fourteen and near the age of forty you complete what you began a quarter century before,”he remarks. 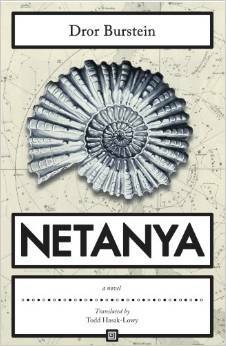 By the way, Netanya is one of several novels that are among the seven finalists for the 2015 JQ Wingate Prize, which was awarded posthumously to W.G. Sebald’s Austerlitz in 2002.